•The croissant dough which i bought come in a tin. When you open it, you will find dough in the form of a square shape. It has some dots on the dough, just cut the dough following the dots and you will end up with eight traingle shaped dough. •Now fill little bit of potato curry in the center of the dough. Start rolling from one end to the other end. Now put the croissants in a baking sheet and bake for 10 to 12 minutes depending upon your oven temperature. 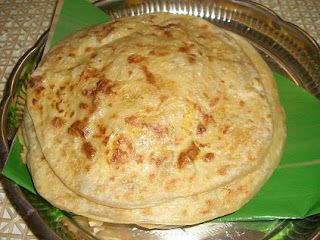 •Can be served with hot and sweet tomato sauce, found in the Indian stores. 1.Croissant dinner rolls are found in any American supermarkets here in the U.S.
2.Make the potato curry little bit more spicy than usual because croissant is buttery and mild. So to compliment that you need to have the curry little spicy. 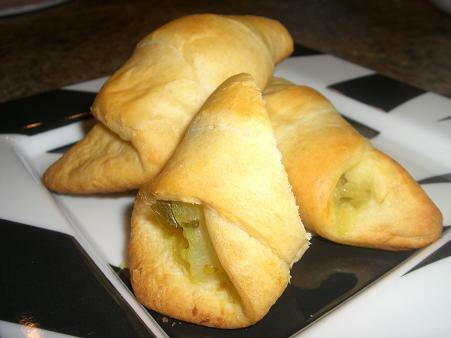 3.Put a good amount of curry inside the dough, because when it bakes the croissant puffs up. •For a sweeter version, instead of potato curry i put few chocolate chips( about 10 ) and few walnuts pieces. •Take a pan add a bit of olive oil and fry the onion with a pich of salt and crushed red pepper. Cook just until they become little soft . Keep them a side. 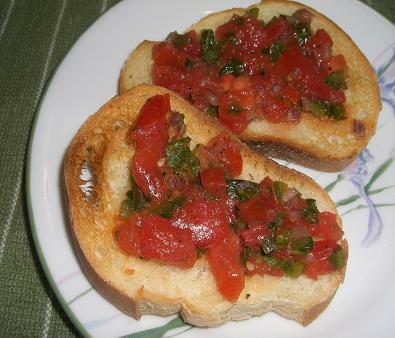 •In the same pan sautee the jalapeno, red and green peppers with a pinch of salt. Cook just for two minutes. Keep them a side. •Now take a nan add a layer of tomato sauce. 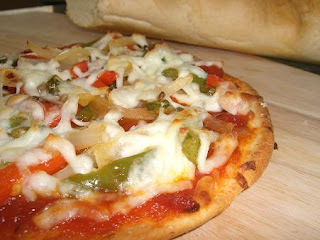 Top it with onion, red, green pepper and some red crushed peppe. Finally top it with shredded mozzarella cheese. •Put it in the toaster oven and cook it just until cheese starts melting. •Since its just two of us, Instead of regular oven i make my pizza in the toaster oven. I dont put any foil or a plate in the bottom of pizza while its cooking. Since the heat comes directly in contact with the surface, you get a nice crispy base. •If you are making for more than two, I would recommend making the pizza in the regular oven. •Don’t over cook the veggies, you still want to have a bite to it. Using a mixer make fine powder of the sugar.In a pan put some ghee and fry the rava till light brown and nice aroma comes. Keep it on the side.In the same pan add few more teaspoons of ghee and fry the freshly grated coconut till it turns pale brown.Remove the coconut, add a tea spoon of ghee and fry the cashews and raisins till golden brown.Now mix the rava, coconut, powdered sugar, cardamom powder, ghee, bit of warm milk, cashews and raisins. Try forming a laddoo with your palms. If the mixture is dry, add some more milk. NOTE: Sugar and ghee can be adjusted according to your taste. 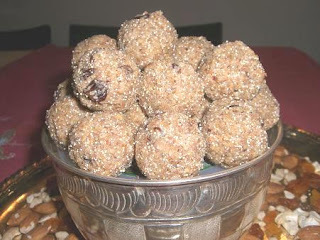 Taste the laddoo for sweetness before making balls. And add accordingly, using powdered sugar makes it easy to incorporate with rava easily. In a plate take 2 tbsps of rice flour, little bit of salt and pepper. Mix and keep it on the side.In a vessel mix the pongal with a tablespoon of rice flour, green chillies, onion, coriander and salt. Make medium size patties with it. It might be little sticky. Now dust both sides of the patties with the rice flour, salt and pepper mixture.In a pan put few teaspoons of oil and fry the patties about 3 minutes on each side. It should have a nice crispy texture on the top. But it will be still soft inside.Serve immediately with coriander chutney. In a vessel mix the onion, chillie powder, coriander and salt. Now add the besan, rice flour, hot oil and mix it well. Now take some water and combine the whole mixture. 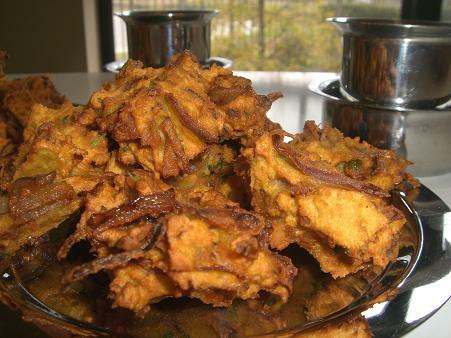 Its important not to add too much water.Deep fry the pakoda making sure not over crowding the pan. 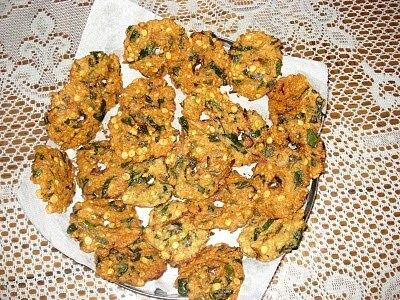 If not the temperature drops and the pakoda become saagi.Enjoy the pakoda with a cup of coffee or tea. 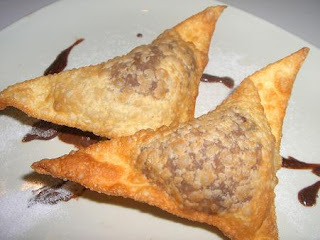 Take a wonton wrap and spoon little bit of the nutella in the center and a piece of almond on top of it.Brush the edges with egg wash or milk. Fold the wrapper diagonally in half and press the sides and make sure the wrapper is sealed on all sides. Keep it on the side. Repeat the same with the other wonton wraps by spreading the nutella and sealing with egg wash.Fry the ravioli in the vegetable oil but make sure the oil is not to hot, if not the ravioli will get dark.Serve when they are hot with a drizzel of more nutella/ powdered sugar on top and enjoy this sinful sweet. 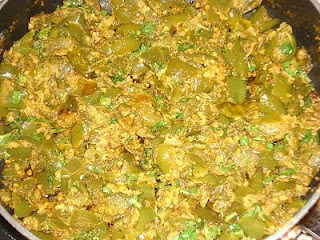 Wash the ridge gourd, peel and chop the skin discarding the pointed edges.In a pan put 1 tsp of oil and fry the urad dal, cumin, coriander and red chilies till light brown color.Remove and in the same pan add 2 tsps of oil and fry the ridge ground till it becomes little soft. Now in a mixer add the dry spices and grind to a powder. Then add the ridge gourd, tamarind, garlic pods and salt and grind to a smooth paste. If you mixer rejects to grind add little bit of water (not too much) that will work.Serve the pachadi with some rice and ghee. In a skillet put half teaspoon of ghee and fry the raisins and cashews till light golden color. Remove and keep it a side. In the same pan put half teaspoon of ghee and lightly toast the rava in a low heat and keep it a side.Now take 1 1/2 cups of water and saffron (slightly rub the saffron in your palm, it helps it melt in the water easily) and let them come to a boil. Reduce the heat to low and slowly add the toasted rava and stir continuously for five minutes.When it starts to thicken, add the condensed milk stirring continuously and making sure the rava doesn’t stick the pan.Cook for another five minutes. Then finally add one teaspoon of ghee, cashews, raisins and the cardamom powder.Coat a tray with some ghee and pour the rava kesari in the tray. 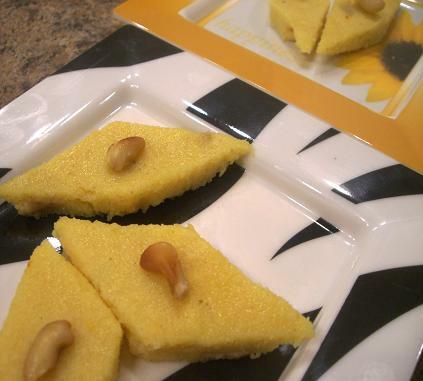 With the help of little bit of ghee spread the kesari and let it sit for few minutes. This helps the rava kesari to thicken. Then cut into pieces, offer to the chinni Krishna as neivedyam and serve your loved once. First grind the poppy seeds in a mixer. Transfer it to a large mixing bowl. Now grind cashews, almonds, coconut,cardamom and jaggery to a fine powder. Remove this mixture and grind the dates to fine powder. Now transfer the rest of the ingredients that were ground and grind it again.Heat few teaspoons of ghee, add raisins and fry till golden brown. Mix this to the above ingredients and try making a laddoo. If needed add more ghee to this mixture till you can mold it in the form of laddoo. Note: Its important to grind the poppy seeds seperately, because it takes more time to grind.And also cutting the dates to small pieces helps it to grind fast. Cut each tindora to four pieces lengthwise. Put the cut tindora in a microwaveable bowl, cover the lid and cook till they are about eighty percent done (I cooked for 5 minutes in my microwave). Like I always say, this reduces the amount of cooking and since you cook in the microwave you need very little oil to pan fry them.Now take a wide skillet add 2 tsps of oil and do the tadka with few mustard seeds, 1 tsp chana dal, ½ tsp urad dal and a pinch of asafatodia (hing). Then add the cooked tindora and the onions and fry them till the onions turn translucent and tindora become soft. This takes about ten minutes. Now add the dhania, jeera powder, garam masala, red chilli powder and jaggery with some salt. Cook for another five minutes. Finish it of with some chopped cilantro and freshly squeezed lemon juice. • Lemon juice and salt. If you happen to have ginger garlic paste from store you can use ½ tsp of it. For tempering:Few cashews fried in oil/ ghee. Grind all the dry spices except for bay leaves and keep it a side.Now grind the wet ingredients with little bit of water (just measure how much water you have used for grinding and reduce that amount while adding water for rice, the point is the total water amount should be not be more than 1 3/4th cup. Otherwise the pulav will become too soft).Now in a skillet add the oil, once it’s hot add the bay leaves and onion. Cook for 3 minutes till onion becomes little soft. Now add the beans and cook for a minute. Then add the dry spices, fry for 30 seconds and add the chopped tomato. Cook for 2 minutes and then add the other veggies accompanied by wet ingredients. Add some salt and let the whole mixture cook for 10 minutes in medium heat.Then add the basmati rice with water, and stir the whole mixture together. You can finish cooking in the same pot, but I generally transfer this whole mixture to a rice cooker and I finish cooking my pulav in there.Meanwhile in a small pan add some ghee and fry the cashews.Sometimes I also add bread to my pulav. What I do is I cut the white bread into small cubes and fry them in little bit of oil (it will look like croutons).Once the pulav is done, let it rest for 10 minutes, then add the fried cashew, bread and lemon juice. 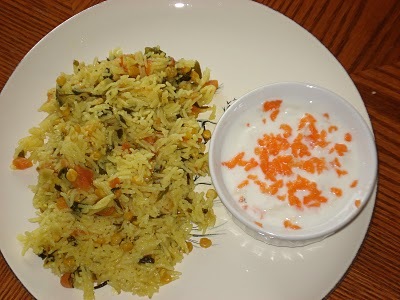 Taste and re season accordingly and enjoy the pulav with cucumber raita. *Soak chana dal and yellow moong dal together in water for 2 hours. Drain the dal, make sure there is absolutely no water left. *In a food processor grind coarsely the dal and green chilies together. Don’t make a paste out of it, Its important that you grind the dal coarsely. *Now to this dal and chillie mixture add the coconut, ginger garlic paste, finely chopped onion, salt, coriander and dil. 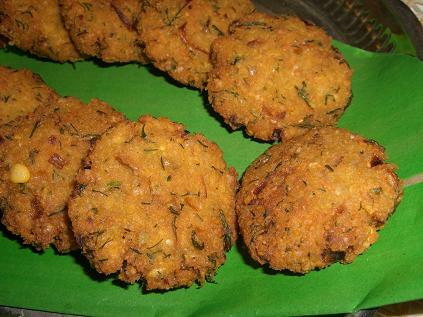 *Heat oil in a deep skillet and fry the vadas. Cook the Toor dal, till its soft but still holding its shape. (See the picture above). It’s important not to over cook the dal. Drain all the water (make sure there is absolutely no water in the dal) and let the dal cool down for few minutes. Now transfer the dal to a food processor with the grated jaggery, coconut and cardamom powder. Pulse or grind the whole mixture till smooth. Taste it, if you feel you need more sweet add little more jaggery to it. The purnam mixture is ready. In case the purnam becomes too soft, that you cannot make round balls out of it- transfer the purnam to a pan and cook on stove in very low medium heat for about 5 to 10 minutes. Remove and let it sit for few minutes, the purnam tends to get dry and firm. Whenever my purnam becomes soft, I transfer my mixture to a microwaveable bowl and cook in the microwave for about 5 minutes with out lid. This makes the purnam dry and easy to roll as round balls. *Mix all the above ingredients with some water. 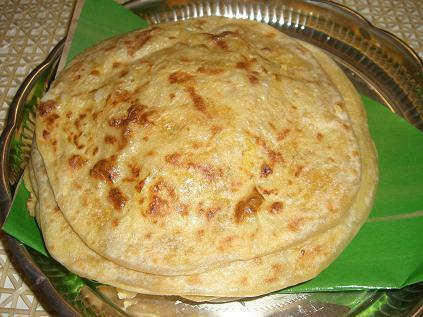 The consistency of the dough should be little bit softer than chapathi dough. When you pull the dough, it should stretch easily. Cover the dough and leave it for an hour or two. *Make round balls of the purnam and keep a side. *Now take the maida dough which has been resting for atleast an hour. How much of dough needed for the purnam? *I take dough which is about 1/3rd the size of my purnam ball. The whole idea is that the dough should be less than the purnam. *Now take an aluminium foil, (I used a plastic banana leaf) put some oil/ghee on it. Take the maida dough spread it little bit, then put the purnam ball and close it. *Now at this point you can roll it like a chapathi using a rolling pin or you can just use your hand (Dip some oil in your hands while rolling the bobbatu) and spread it slowly. *What I have done is, instead of using my hands or a rolling pin; I put one more banana leaf on top of the purnam and slowly pressed it down till it formed like a chapathi. I think this is definitely a much easier way of rolling. *Now on pan, put some oil/ghee and cook the bobbatlu on a very low heat. *Right before serving apply some more Ghee to it and enjoy the bobbatlu with your loved once. *Break the coconut and use half of it. Cut the coconut in to small chunks. *Grind the chillies, coconut, tamarind juice and salt coarsely. Make sure not to make a paste out of it. *Now add some chopped onion and just give a pulse. You should still be able to see some chunks of onion. *Add the tadka to the coconut chutney and enjoy with some hot rice. Note: Adjust the chilies and tamarind juice according to your taste. Mix the tomato paste in water and keep it a side. Now do the popu or tadka (1 tsp oil, few mustard seeds, 1 tsp jeera, 1 dry red chillie, pinch of hing and curry leaves). Add the tomato paste with water, rasam powder, salt and sugar to the popu. Boil the rasam in the medium low heat for about ten to fifteen minutes. 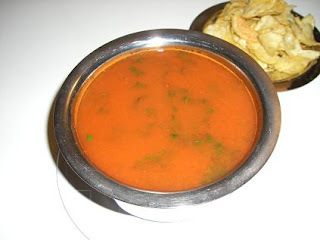 By now the rasam should look some what like a thick liquid. Taste and reseason accordingly, with chopped cilantro on top. 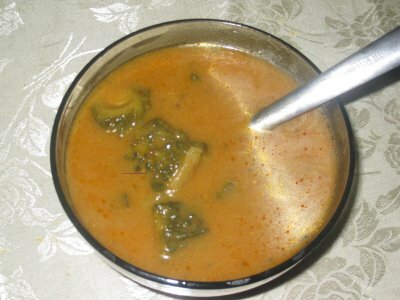 This rasam can be eaten as soup also. But really goes well with rice and all you need is some potatoe chips on the side. •Cook the rice with two cups of water. Remove the lid and let the rice dry a little bit. •Grate the mango using a food processor or any other grater you have. •In a pan put some oil and fry the peanuts till they become crisp. Once done, remove and keep them a side. 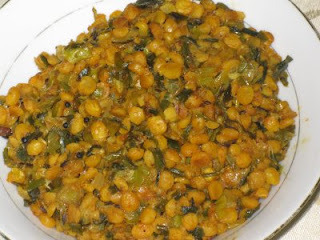 •In the same pan add few more tsps of vegetable oil and prepare the popu or tadka( few mustard seeds, 1 tsp chana dal, 1/2 tsp urad dal, few curry leaves and three pinches of Asafetida ). •Now add the green chillies. once the chillies are fried add the grated mango , cook just for a minute and turn off the heat. •Add the peanuts, cooked rice, cilantro and salt to the above mixture and serve. Note: If the mango is not sour, you can add some lemon juice to the rice. *Soak Moong Dal and ChanaDal for about 3-4 hours. *Grind the moong dal.Add all other ingredients to the grinded moong dal in a wide bowl. *Make small balls from the above mix. *Place these onto a wet cloth on a flat surface and press the balls slightly with hand. *Pour sufficient oil in a hallow pan, such that the pressed balls can be immersed in it. *Heat the pan with oil sufficiently. *Put each of the pressed ball into the pan, and fry them until they turn into golden brown. *During this frying process, make sure your turn the pressed flattend balls both sides. *Serve them hot with any combination of chutney you desire. *Take the ridge gourds(beerakaya) and peel them. *Clean them and cut into small pieces. *Now take a pan , pour oil of 3-4 tbsp and heat it. 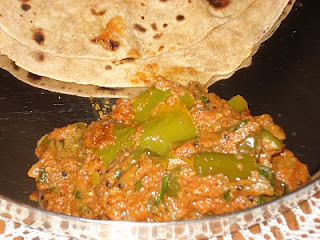 *Add the jeera(jeelakarra) ,chopped onions and then the green chillies. *cover the pan with a lid and let the ridge gourd(beerakaya) get cooked. *After it is cooked add the red chilli powder and salt. *Now break the eggs in a bowl and beat them properly. *Add the eggs to the ridge gourd(beerakaya) in the pan and cover with lid. *After 3-5 minutes stir the curry properly. 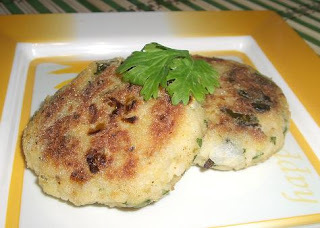 *After the eggs are cooked properly add the coriander powder(daniyala Podi) and coriander leaves(kottimeera). 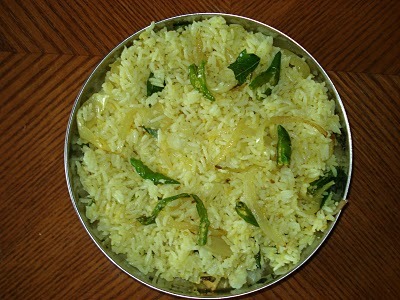 *Now our curry is ready.It tastes great with rice,chapathi. Popu annam is the common dish made in Telangana.It is very tasty and easy to make.Popu is toasting the listed ingredients in oil and annam means rice. *Cook the rice with 4 cups of water and allow it to cool. *Chop the onions finely and cut the green chillies. *Now take the oil of 4 to 5 tbsps in a hallow pan. *Add jeera,green chillies,onions,curry leaves and tumeric powder.Fry them. *Now add the rice and and stir properly and allow it for 10 minutes on the stove. *Your Popu annam is ready. *Wash the shrimp properly with curd and tumeric powder. *Add the red chilli powder,coriander powder , garam masala powder and keep aside for about 1 hour. *Heat oil in a flat pan,then saute chopped onions and ginger garlic paste. *Let the masala cook on a low flame until the oil seperates. *Now add shrimp (it takes very little time to cook) at this stage, mix well to coat the masala. 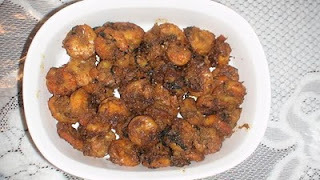 *Fry the shrimp properly and finish the dish. 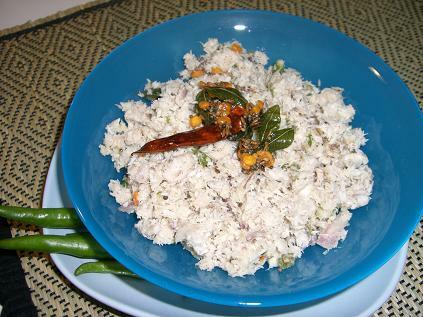 *Serves great with chapathi and rice. Sabudana" is the Hindi/Marathi word for pearl sago. Sabudana "grains" look like tapioca and are small dry, white balls. When cooked they turn from their opaque white color to translucent, and become soft and spongy. In North and western India it is most commonly used in fasting dishes, such as sabudana khichdi and sabudana wada. 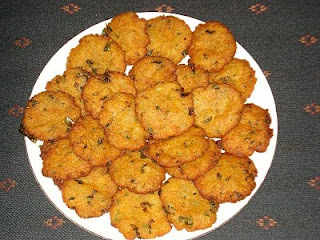 In South India they are used to make small pappadam wafers, wadas and also for making a variant of a sweet semi liquid desert called Payasam or kheer. *Soak the sabudana for about 5 minutes in water. *Drain the water from the sabudana using a mesh.Leave it about 2 hours. 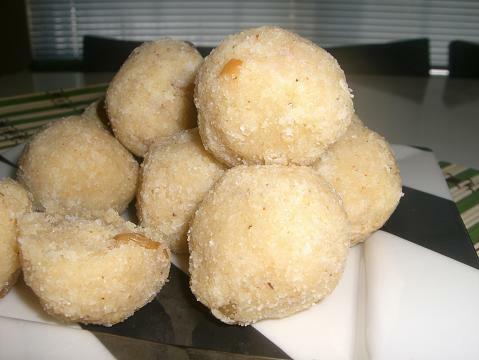 *The sabudana now turns into big soft,transparent balls. 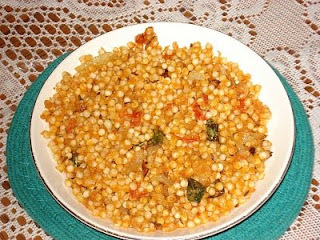 *Make powder from putana dal(putnala pappu) and red chilli powder. *Take oil of about 3 to 4 tbsps in a pan. *Add jeera,green chillies,tomato and onions. *After they are fried well add the turmeric powder. *Then add sabudana and mix well. *Finally add the salt ,powder made from putnala pappu and red chilli. *Take a pan and roast the seasame seeds and coriander seeds. *Now take another pan and add some oil. *Add the urad dal ,red chillies ,fry them and keep aside. *Then add some oil in the pan add the pudina leaves and tamarind. *Cover the pan with a lid and fry pudina well. *After it is fried well turn off the stove and allow it to cool. *Now grind all the ingredients finely. *Our spicy pudina chutney is ready.Tastes great with rice. 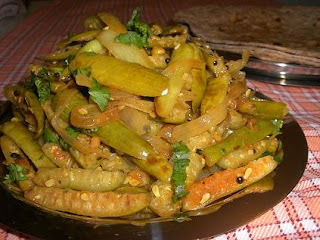 *Slit the mirchi and remove the seeds and cut to 2 inch pieces. *Put them in salt water till u have made the ingredients for about 10min. *Make a powder of nuvvulu or palli along with red chillies,salt,dhaniya,jeera added .We can use tomato or tamarind for the gravy. *Put oil in pan, add the popu ,add the mirchis and let it cook on slow flame with the lid. *Now make a paste of tomato by grinding it or a thick paste of tamarind. *When the mirchi colour turns from dark green to light shade,add the powder made from nuvvulu and others and mix it well. *Now add tomato and let it boil and thicken,if needed add some water,or else use it like that only. *Tastes great with chapathi or rice. *Wash the poha in running water. *Then take in a bowl and add water as much that the poha can soak. *Now the poha becomes soft.Mash it finely. *Also mash the boiled potato and bread slices in it. *Add the rest of all the ingredients. *Make small balls of it and flatten it. *For frying the cutlets heat the oil really well and don't keep them too long in the oil as they may break.Fry on medium flame. *Serve hot with tomato ketchup. *First we need to prepare the Idly batter. 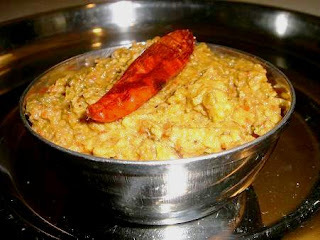 *Soak the urad dal for about 3-4 hrs and grind it to a smooth batter. *Then add the rava add and keep it overnight for fermentation. 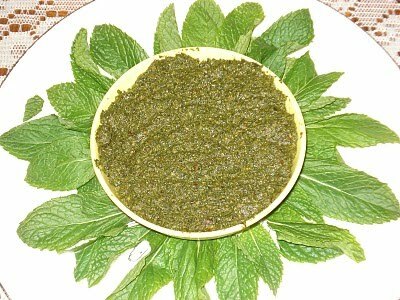 *Now take some oil in a pan , add the spring onions,coriander leaves,mint leaves,grated carrot,finely chopped green chilles and fry them well. *After then add this mixture to the idly batter and some salt for taste. *Now grease the Idly plates with oil and pour the batter.Repeat this for all the idli plates. 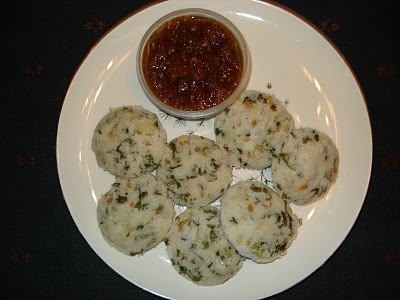 *Place the idly stand in a idly cooker and steam them for about 20 minutes. *After they are done remove the idlies with the help of a spoon. *Serve hot with coconut chutney or ginger chutney. *Soak tamarind in water of about 350ml. *Peel and cut ginger into small pieces. *Grate the jaggery and keep it aside. *Now grind the tamarind,ginger,red chilli powder and methi powder into a fine paste. *Then add the grated jaggery and grind for some more time. *Dont add any water.Be sure that all the ginger pieces have been ground fine. *Now add some oil in a pan ,add mustard seeds and urad dal. *When the Mustard seeds splutter add the ground paste to it and fry for a few seconds. *Cut the capsicums into small pieces. *Roast the sesame seeds on a low flame .Grind them and make powder. 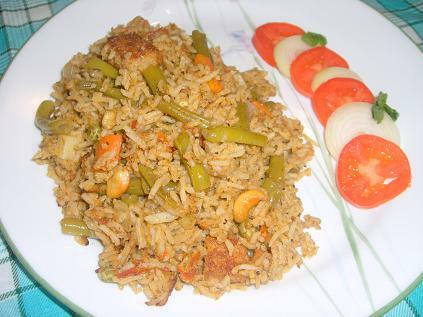 *Take some oil in a pan .Add jeera ,green chillies,onions and fry them. *Now add the chopped capscium ,stir well and cover the pan with a lid. 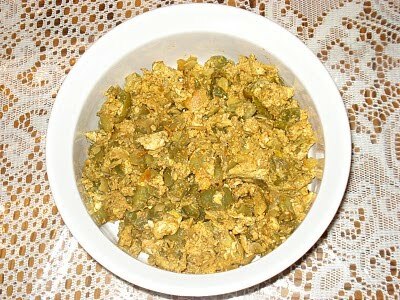 *After the capsciums are cooked well take off the lid , add red chilli powder,salt and fry till the oil comes out. *Then add the coconut powder,sesame powder and fry for some more time. Finely add the coriander leaves. 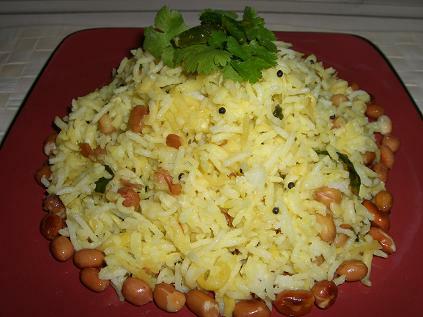 *Serve hot with rice or chapathi. *Heat oil in a pan which is hallow and wide enough to cook the rice. *Now add bay leaves,cinnamon and cloves. *Then add the cumin seeds,curry leaves,carrots,tomato,onions,tumeric powder and ginger garlic paste and allow them to fry for a few seconds. *Meanwhile wash the rice and dal and keep them in water.Then add salt for taste. *Finally add the rice and dal along with water and allow it to cook. *De-steam pappy biyyam and serve hot with raita. TIP:If you want to cook in a electric cooker.Wash the rice and dal and add sufficient water to cook and all the ingredients which we have fried above in the pan. *Cut the kakarakaya into 3 pieces and put in salt water and remove the seeds with a spoon. *Take a pan and heat it. *Dry roast the nuvvulu, cool it and grind the nuvvula podi. *Soak the tamarind and remove the pulp . *Now, take a thick bottom pan and add the oil . *Let the kakarakaya pieces colour change to light green. *Add the karam,dhaniya podi to the pieces and mix it well. *Now add the tamarind pulp and let it boil for 15 minutes. *Next add the salt,bellam,allam velipaya paste and let it boil for another 10 minutes. *Once the pulusu starts becoming thick ,add nuvvula podhi, methi podhi and curry leaves. *Continue till oil starts appearing on the surface. once the colour and consistence looks good remove from heat and serve with rice. *Soak the chana dal for 1 hour. *Cut the ullikadha(spring onions) into 1/2 inch length. *In a pan heat oil and add jeera, mustard seeds, turmeric powder. *Now add the chana dal and ullikadha and stir well. *Cover the pan with lid and cook for 5 minutes. *Now add the ginger garlic paste, chilli powder and salt. *Cover the pan again with a lid and cook for 10 minutes stirring in between. 1.Scrape the 2 teaspoons of zest from one of the lemons, then cut all of the lemons in half and juice them. Measure 1 cup, reserving the rest for another use. 2.Use a melon baller to remove any remaining pulp. Slightly trim the bottom of each lemon cup so it sits flat, then set them on a plate, cover, and place them in the refrigerator. 3.In a medium saucepan, combine the water and sugar over medium heat, stirring until the sugar has dissolved. Bring the water to a boil, then add the lemon juice and zest and boil for 2 minutes. 4.Transfer the liquid to a mixing bowl and allow it to cool to room temperature. Place the bowl in the freezer until the mixture begins to freeze, several hours or overnight. Use a fork to break up the ice, then stir it until fluffy. 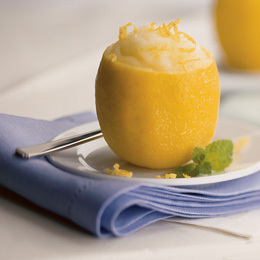 5.Spoon 1/2 cup of the slush into each lemon half, then cover them and freeze until you're ready to serve. Garnish with a mint leaf and lemon zest before serving, if you like. Serves 8 to 10.